Once again The Quill traveled to a bowling tournament. 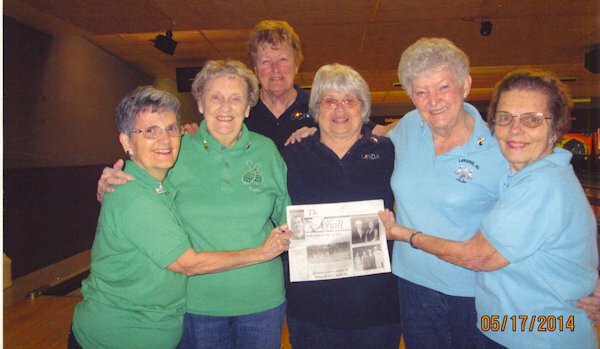 Donna Hinshaw, Rose Boyer, Donna Olson, Linda Denison, June Galbraith and Pat Dunn took The Quill to the Iowa Women's Senior Tournament in Iowa Falls, Iowa on May 17th. When you go on a trip, take "The Quill" along and have your picture taken with it and then send it to us. Let's see where all "The Quill" can travel.